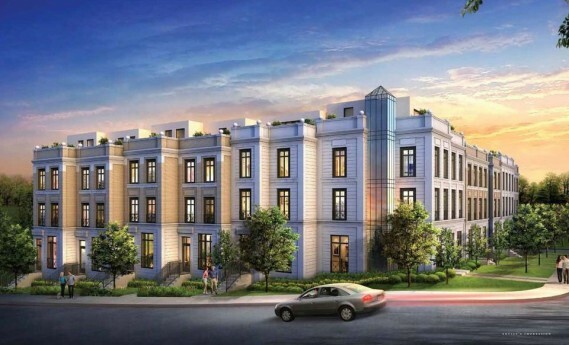 1046 Avenue Road – Bousfields Inc.
Bousfields was retained by a private landowner to provide planning expertise regarding a condominium townhouse development at 1046 Avenue Road, just north of Eglinton Avenue. Although designated “Neighbourhoods” in the Official Plan, the large dimensions of the site, its location on a major road, and its proximity to the future Crosstown LRT warrant development at a higher density than the surrounding neighbourhoods. Bousfields prepared a Planning Rationale, draft zoning by-law and project management in support of the rezoning application. The City initially did not support the project and the application was appealed to the Ontario Municipal Board, but through ongoing consultation with city staff and the community, a settlement was reached which allowed for an effective development of the site that fit well within its urban context. Paul Zamodits provided planning and urban design testimony in favour of the settlement at the Ontario Municipal Board, leading to the project’s approval. Images courtesy of The Slubor Group LTD.